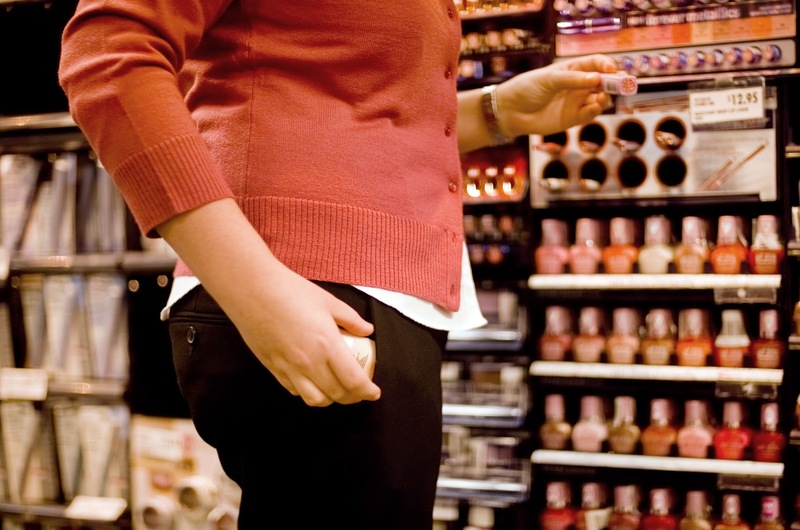 Justice For Children and Youth (JFCY): What Happens if My Friend Shoplifts? Camilla is first in line at the checkout so when she is done paying for her nail polish, she goes to look for Natalie. From a distance Camilla notices that Natalie is still in the aisle with the nail polish. She continues to walk toward her and notices Natalie grab a bottle of the nail polish off the shelf, throw it in her purse and then head in the opposite direction. Camilla is shocked and doesn’t know what to do; she asks Natalie what she is doing. Natalie replies with a smile and tells Camilla “I’ll grab one for you too, act natural“. Camilla doesn’t want her to friend to be mad at her so she does as told. One by one her friends finish cashing out and join her, then they all leave the store and head back to school since their lunch period is almost over. WHAT WILL HAPPEN IF NATALIE IS CAUGHT? If Natalie is caught shoplifting the nail polish, the store security may try to have her sign a document regarding the situation that asks her to take full responsibility for the incident and pay all of the related security costs. She does not have to sign this document but even if she does, she is not required to make the payment claimed. The security may also keep her at the store until the police arrive but they must call the police within a reasonable time. In Ontario law, you are responsible to compensate someone if you caused them harm by stealing things that belong to them or by trespassing on their property. However, if Natalie returns the nail polish that she stole, the stole will have lost no money as the shoplifted items have been recovered. The store may also send a Civil Recovery Demand Letter. Stores often send these demand letters to people who have been caught shoplifting in their stores,or to parents of young people who have also been caught. These letters are often signed by a lawyer and demand payment of amounts in the range of $300.00 to $475.00 to a collection agency, called "Civil Recovery" claiming the security costs of detecting shoplifters in their stores. The letters sometimes suggest that if you don't pay by a certain date the amounts will increase. If you do not pay, the store might also start a lawsuit. It is important to know that Natalie and Natalie's parents do not have to pay the amount in the letter. It is simply a threat that cannot be enforced unless it is found to be a valid debt in Small Claims Court. Her family does not need to worry unless they receive a Statement of Claim in the mail. In Justice For Children and Youth's experience - this does not happen. Natalie's parents can rest assured as well that no harm will come to their credit rating as a result of these letters. If the store chooses to call the police, she may be charged under s. 322 of the Criminal Code. This offence is for committing theft: ...fraudulently and without colour of right takes, or fraudulently and without colour of right converts to his use or to the use of another person, anything, whether animate or inanimate, with intent to deprive, temporarily or absolutely, the owner of it, or a person who has a special property or interest in it, of the thing or of his property or interest in it. Camilla does not have a legal obligation to report Natalie’s theft to employees of the store, to the police or even to her parents. However, If Camilla does not try to stop Natalie or leave the situation, she may be charged as a party to the offence. This is a criminal offence in the Criminal Code of Canada. Under s.21 (1) of the Criminal Code, everyone is a party to an offence who: (a) actually commits it; (b) does or omits to do anything for the purpose of aiding any person to commit it; or (c) abets any person in committing it. Section 21(1) describes three situations where a person is a “party,” i.e., criminally responsible for the conduct of another. In order to be found guilty of the offence or for the charge to be reasonable, there must be some evidence that Camilla intended to assist Natalie or that she stood somewhere so that the store wouldn't notice Natalie put the item in the bag.